Sterling silver charm bracelet is a snake chain style that is designed for Celtic charms. This charm bracelet has been hallmarked sterling silver by the Irish Assay Office at Dublin Castle in Ireland. This snake chain charm bracelet is ideal for all your sterling silver shamrock and Claddagh charms and it measures 7 1/2” long with a 2” extender chain and a lobster claw catch. The charm bracelet is suitable for all competing beads and it is made by Solvar Jewelry in Dublin, Ireland. 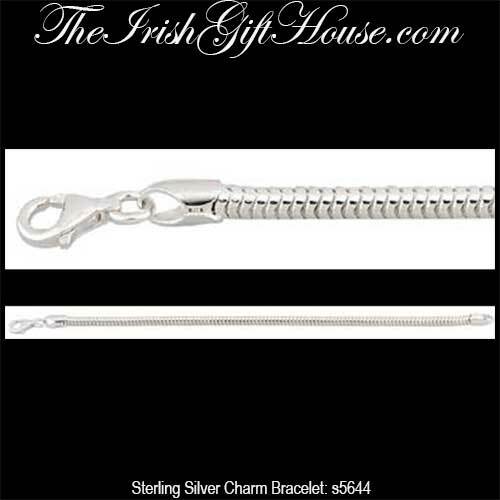 The sterling silver bracelet is gift boxed, complements of The Irish Gift House. Tree of Life charm with Celtic knot-work is fashioned in sterling silver and is designed for a bead bracelet.